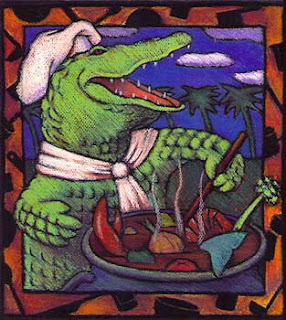 This month, John and I have been mostly eating experiments in Cajun Cuisine, because I have been practising for his upcoming birthday party in July. We decided that a Cajun them would be fun, because we love the music and we love the food - think "Jambalaya, Crawfish Pie, File Gumbo"! Of course, I love to cook and (beingOCD me) I want to make it as authentic as possible - hence lots of research and all the experiments. One of the first things I discovered was that Gumbo can be made with any meat or fish you can catch and put in the pot - rabbit, fish, chicken, squirrel for example. What is really important is how you thicken your Gumbo - with roux, okra or file powder - and apparently everyone has their favourite method. So, I've tried it with okra and with roux - Cajun roux is very different from the roux I would normally make say for a cheese sauce, because you make it with oil and you cook it for ages until it is quite dark. Just out of curiosity I really wanted to try the file version as well (there should be an accent over the "e" but I can't work out how to do it on this keyboard) - this is made with ground sassafras leaves and I have to say I've never noticed any in Sainsbury's! A couple of other Cajun ingredients I could substitute if necessary (such as Polish Kabanos for Cajun smoked sausage) - but I really wanted to try the file, so I online again and BINGO! Seasoned Pioneers are based in the UK and stock ground file leaves WooHOO! I spent a very happy half hour browsing their virtual shelves and discovered that they had loads of other spices which I REALLY NEEDED RIGHT NOW including Galangal, Chermoula Spice Blend, Sumac Berries, Kashmiri Chillies. Their website also has loads of information, advice and recipes - brilliant! I've never heard of those spices, but it's always fun to experiment! Enjoy!